SAN IGNACIO, Cayo District, Mon. Feb. 20, 2017–Alvaro Aldana, 23, was murdered on Sunday night in “PK Park” in San Ignacio Town, just before midnight on Sunday night, by his rival in a love triangle turned deadly. His aunt told Amandala that she had been having some drinks in the park a few yards away from the scene when she saw the incident unfold, but could not recognize the victim. She told us that it was not until the following morning that she learned that it was her nephew who had been murdered. Aldana’s aunt told us that he was in the park socializing with a woman when the woman’s boyfriend, identified only as “Edgar,” confronted them. Upon seeing “Edgar,” Aldana told the woman to run. Aldana was thereafter shot below his eye, shot twice in the left side of his body and stabbed once in his back. His attacker then fled the scene on foot. Aldana was motionless by the time officers arrived on the scene. He was taken to the San Ignacio Community Hospital, where he was pronounced dead on arrival. His aunt told us that he had been living in San Pedro for the last ten months and just arrived in San Ignacio and was killed less than 24 hours later. Police have not detained anyone as yet in connection with the slaying and are asking anyone with information concerning this incident to contact the nearest police station or San Ignacio police at 804-2022. 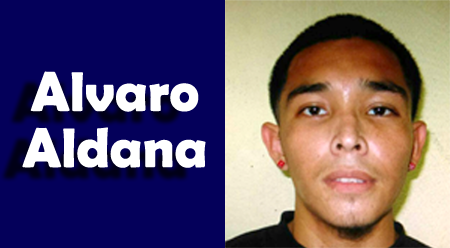 If the name Alvaro Aldana sounds familiar, that is because he has a long rap sheet dating as far back as 2010 when he was charged with keeping a firearm without a gun license, and aggravated assault in three separate incidents. In 2012, Aldana was arraigned for the foiled robbery of E’s Cool Spot in Esperanza, Cayo District, in which an officer was shot. In 2013 he was charged with keeping ammunition without a gun license.